Take the Road less travelled from Wears Valley Road directly into Great Smoky Mountains National Park with its towering mountain peaks and lush foliage. 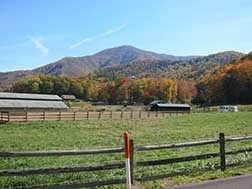 Lyon Springs Road runs directly off Wears Valley Road at the Smoky Mountain Store where the pony rides are. 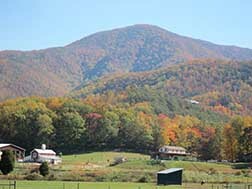 Picturesque pastures and farmland will take you into true mountain life where lies some of the most beautiful and peaceful countryside in America. Enjoy photogenic foliage opportunities along Lyon Springs Road to Metcalf Bottoms in the National Park, only 4.4 miles from Wears Valley. You will see a breathtakingly beautiful private ranch, mountainsides with lush foliage, floral and fauna, and maybe some wildlife. 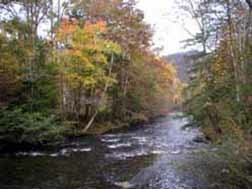 Once you arrive at Metcalf Bottoms, stop at the beautiful mountain river flowing through the picnic area. Dip your feet in its cool waters before venturing further into the National Park.